In a slide posted on Twitter today from CTO and co-founder Parker Harris’s presentation to a group of analysts, the company revealed that it has even bigger goals, much bigger. We all had heard about the $20 billion goal by 2022, but how about $40 billion by 2028 and $60 billion by 2034? 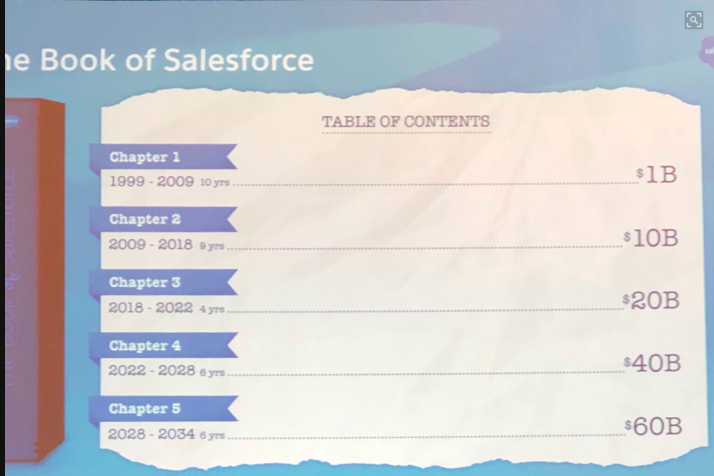 As Salesforce sees it, their revenue goals are like the chapters in a book. As we enter 2018, the company is just beginning Chapter 3, the $20 billion goal. Beyond that Chapters 4 and 5 loom with the goal of adding $20 billion every six years. That’s quite an aggressive set of ambitions for any company. Let’s face it, for a company to reach a billion dollars in revenue is a great success, but to set a goal of $60 billion is an entirely different matter. To put it in perspective, Oracle was a $37 billion company in 2017 (according to Statista) Microsoft was a whopping $90 billion company last year, so it’s not completely outrageous, but it would probably require that the company continue to be aggressively acquisitive as it was in 2016 and to maintain its steady record of growth for the next 17 years. The company would need to maintain its market leadership, something that just about any successful company can tell you isn’t easy to do, especially in an age when a smart upstart can undercut your market before you even know what happened. But to this point, Salesforce has not been an ordinary company. It is not simply sitting back and protecting its turf. It continues to innovate and make strategic purchases to keep itself very much on the cutting edge of technological change, whether that is artificial intelligence or the Internet of Things. Companies tend to get into trouble when they protect their markets and fail to innovate. While Salesforce might be moving to harden its market dominance across all areas of the customer experience, to this point at least, it has not shown signs that it is sitting still or failing to innovate. No company is just going to stop because it achieved a goal and Salesforce is no exception, but it’s not just setting goals for the future, it’s setting extremely tough ones. Nobody knows what the future brings or what impact positive or negative economic forces will have on Salesforce and indeed all big tech companies, but the numbers are out there now, and it’s up to them to execute.